Last season, Minnesota's Mitch Leidner completed 55.1 percent of his passes for 619 yards and three scores and ran for 407 yards on 102 carries. MINNEAPOLIS — During the Gophers’ first team meeting after their Texas Bowl loss to Syracuse, coach Jerry Kill looked Mitch Leidner’s direction and spoke plainly, speaking plainly in that lower-Midwestern, Kansas drawl of his. "This is your leader," Kill told the players returning for his fourth year at the helm. Straightforward enough. But after navigating a convoluted quarterback situation last year with as many twists and turns as Minnesota’s eight-win season as a whole, a little clarity around the Gibson-Nagurski complex registers as refreshing. That goes for the team’s heavily projected starter, the players around him, and the coaches directing him. "There’s something special about playing quarterback; there’s an ‘it’ factor," offensive coordinator Matt Limegrover said Tuesday after the program’s first spring practice of 2014. "And I think Mitch is being allowed to exhibit that, what he has as far as that ‘it’ factor goes, because he doesn’t have to be reserved, doesn’t have to be diplomatic. He can just go ahead and be who he is." Said Leidner: "I feel like I can step into that role much easier now. I don’t have to ever look back now." So after splitting time, attention and leadership duties with departed Philip Nelson last season, Leidner has spent this one assuming those responsibilities all on his own. During winter workouts, that meant organizing captain’s practices and barking at teammates in the weight room. Tuesday, it meant showing off his strong throwing arm and exhibiting command in the huddle. Without one eye looking over his shoulder. "I think that it wasn’t as much pressure as it was I think it’s tough when you have two guys or more guys, and you’re not sure where it all fits," Limegrover said. "Now, (Kill) basically said ‘Hey, Mitch, for better or for worse, here we go.’"
Leidner entered 2013, his redshirt freshman campaign, in what Kill characterized as a neck-and-neck competition for the starting signal-caller spot. That eventually went to Nelson, with Leidner appearing in 10 games — primarily either as a changeup when Nelson struggled or a backup when he was hurt. Patiently biding his time, Leidner completed 55.1 percent of his passes for 619 yards and three scores and ran for 407 yards on 102 carries. But it wasn’t easy wondering when his next opportunity would come, he admitted Tuesday. "It can definitely be difficult, especially rotating in there," Leidner said. "Sometimes, you don’t really know when you’re gonna get in, when you’re gonna be playing. But at the same time, you just have to stay positive. "Your teammates are seeing what you’re doing. They’re respecting that, and that’s what helped me get to this point." So did Nelson’s decision to transfer to incoming Big Ten member Rutgers, citing a desire to play in a scheme that better utilized his passing abilities. That left the reins waiting for Leidner. 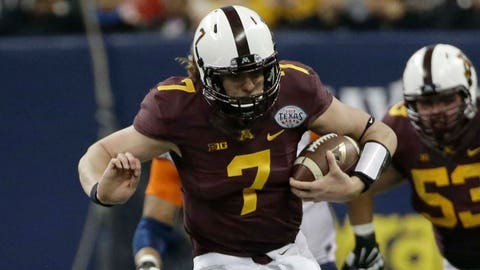 He’s the only Gophers quarterback with any collegiate experience. Freshmen Chris Streveler and Conor Rhoda redshirted last season, and three-star true freshman Dimonic Roden-McKinzy participated in his first-ever practice Tuesday after enrolling at semester. Leidner, who checks in this spring at 6-foot-4 and 233 pounds, threw the best ball of any of them as Minnesota worked out without pads. The 1-hour, 45-minute session featured heavy doses of position-group technique work and team scrimmages. As media, recruits and even former Gophers quarterback Adam Weber — the leading passer in program history — looked on, Leidner took most of the first-team snaps and had noticeable zip on his throws. "I thought he did a really good job," Kill said. "I thought he looked crisp — boom, boom, boom." With 1,000-yard rusher David Cobb leading a stable of returning running backs and a beefy, experienced offensive line, Leidner should expect big assists via both the ground game and pass protection throughout the spring and next fall. But perhaps his best form of support comes from within — a knowledge that the game’s highest-profile position is his to lose. "I think it helps the offense as well as it helps Mitch," Cobb said. "There’s not that panic, that worry, that stress everywhere. Are you gonna be switching every drive? I think you can focus on what you need to get better at, focus on being a leader and just getting better at his skill."